This is the Great Eastern Cutlery Tidioute Allegheny Large Coke Bottle, has Autumn Gold Bone handles and Brass liners. The blade steel is 1095 and finish is Satin. *Our opinion: The pull is a 5. The GEC effort on this run as compared to their entire catalog is 7. Action (walk) is 2 on a scale of 1-5, with 5 being gator snap. Spring Pressure is 1.71 lbs. I agree with other reviewers. It must be difficult to get “walk & talk” that satisfies everyone, but in this case I think it should have been stronger. I view it the same as getting the detente “right” for a liner-lock. 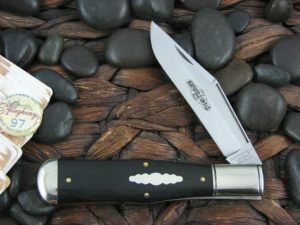 You can often overlook a minor problem in the appearance, but these two issues affect the way the knife feels in use. Given the fit and finish is up to par (i.e. excellent) it’s hard for me to give an average rating, but in this case it really is. No regrets here. Neither have a real strong gator snap. One actually had to be pushed to close. After some Break Free and repeated opening and closing a fair amount of black gunk was cleaned out (polishing residue?) and it will close on its own after half stop. The 2 star rating is really too harsh in my opinion. Every other aspect about this knife is sweet. Zero play. One will go into use and the other to collect. I look forward to getting the yellow rose I have on reserve. 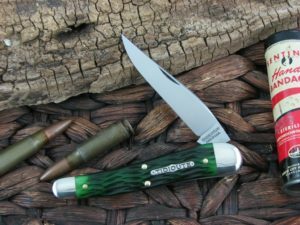 A very beautiful hunter with a wobble-free well-centered blade and perfect fit and finish. The opening and closing of the blade is smooth but on the light side, however, after some cleaning and use the half-stop stiffened and became snappy when closing the blade. Wow. Bigger than I thought. GEC is sorta a recent find for me and I’ve been buying a few especially in the last few months. I too noticed a lighter pull, but figured it could be a leverage thing since it is a fairly large knife. This will not deter me from picking up another one or two of this pattern. If you appreciate a strong blade snap and a fluid pivot action, you will be disappointed in this product. It is unfortunate that GEC cannot sustain their pre 2014 walk and talk standards. I have to agree with RFL. 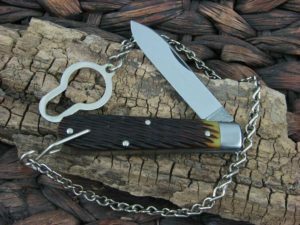 The back spring is not strong enough to hold the blade securely open. I do appreciate the ease of opening but not sure the trade off is worth it. The spring pressure, which is the amount of force to move the blade from fully opened to half open, is 2.65 lbs. 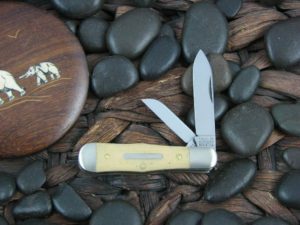 Which is right in line with several other recent patterns I have added to the website – to include some GEC and some Case knives. I too wish the spring was a little stiffer; but I think this perception of an insecure spring pressure is just that, a perception. I don’t think it is as much ability as desire to maintain that gator snap on every model. I agree these don’t have the snappy action many like, but the flow is very nice and the spring pressure comes in surprisingly in the middle ranges.